Fears Grow Over Faulty French-Made Breast Implants French and German companies are under scrutiny for defective breast implants containing industrial-grade silicone. Up to 400,000 women in Europe and beyond have the implants, made by a company that was shut down in 2010 because of abnormally high rupture rates for its product. 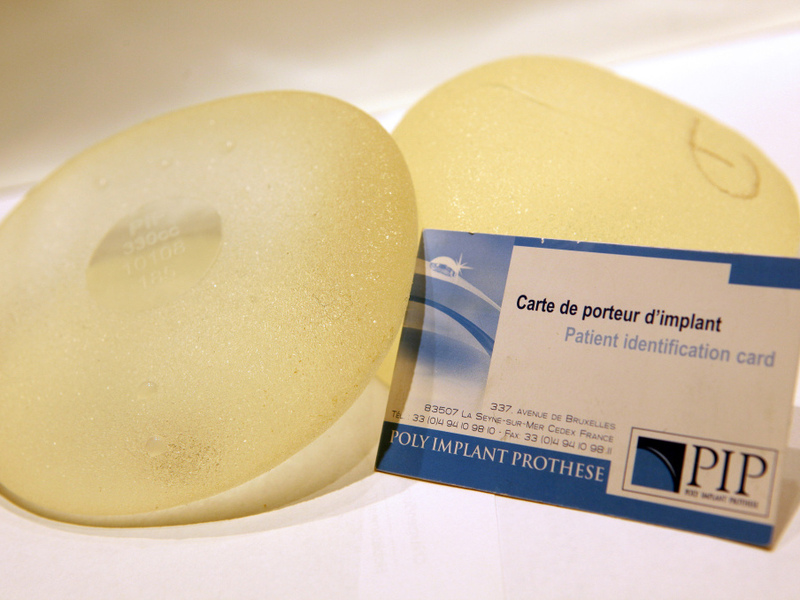 French-made breast implants produced by the Poly Implant Prothese company have been found to be faulty and are at the heart of a growing health scandal. A scandal involving French-made breast implants continues to widen. The implants contain industrial-grade silicone that causes abnormally high rupture rates, according to critics. They have been sold in many countries in Europe and beyond, though not in the United States. Now, the French government has opened a criminal investigation into the company. French television showed footage on Thursday of investigators and a judge searching the factory of the Poly Implant Prothese company, or PIP, in southern France. The probe could potentially lead to charges of involuntary homicide against the firm. PIP was shut down and its products banned in 2010. By this point, an estimated 400,000 women worldwide had received the PIP implants. Christian Marinetti was one of the first plastic surgeons to notice a problem with them. As soon as they tell you the implants are fragile, it radically changes the way you live. You buckle your seat belt differently, carry your groceries and children in another way, you're worried about doing sports, and you're always stressed by any sort of changes. "We began informing health authorities about the high rupture rate as early as 2007. And in 2008 and 2009, we kept contacting them. It was clear there was a serious problem with these implants," Marinetti says. Both French and German health authorities are now under fire for not taking action sooner. A German company provided the industrial silicone, and it has just come to light that another German company paid by PIP was in charge of inspecting the implants. French Health Minister Xavier Bertrand says investigators will get to the bottom of it. He wants to know at what point the companies were alerted about the problems, and what controls were in place. He says it's clear the implants were substandard. Fears over the implants spread globally last month after a French woman with ruptured implants died of cancer. French health authorities advised 30,000 French women to have their PIP implants removed. The French state has offered to bear the cost of the removals, which could come to more than $75 million. Murielle Agelo, 37, has never had a problem with her implants, but says she will get them removed. "As soon as they tell you the implants are fragile, it radically changes the way you live. You buckle your seat belt differently, carry your groceries and children in another way, you're worried about doing sports, and you're always stressed by any sort of changes," she says. PIP implants' low price made them popular, especially in Britain, where an estimated 50,000 women got them. Catherine Kydd received PIP implants in 2004. In 2009 she found out one had ruptured. Though she had them removed, silicone had already leaked into her lymph nodes. "If I was told that I was going to have industrial silicone put in me, then I would never have had it done, as would none of the 50,000 women," she says. "If that's what you knew you were going to get, you wouldn't sign the dotted line, would you?" The British government is taking a more cautious approach than the French. It has not yet recommended the mass removal of the implants. Perhaps fearing the costs of such an operation, Britain's health secretary, Andrew Lansley, is urging private clinics to take some responsibility, calling it an ethical and moral obligation. "My expectation is that the private sector, as the providers of these implants, they should give women access to information, to specialist advice, to scanning, and if necessary, to follow-up and remedial treatment," Lansley says. But many clinics, including those that provide breast reconstruction for cancer patients, say they bought the PIP implants in good faith and will go out of business if made to bear the full costs of removal. The Czech government on Thursday recommended women wearing PIP implants have them removed. And Friday, some 200 Venezuelan women say they will join a French lawsuit against the company.